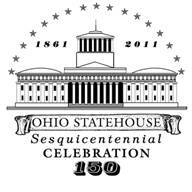 Columbus, OH – The people of Ohio will celebrate the sesquicentennial of the Ohio Statehouse throughout 2011. The Ohio Statehouse has served as the heart of Ohio democracy for the last 150 years. Throughout the state, the Ohio Statehouse stands as a symbol of the legislative and executive branches of state government, and the people of Ohio. Red, white and blue patriotic bunting will adorn the west columns of the Ohio Statehouse throughout 2011. The bunting will draw attention to the significance of the Statehouse’s year-long sesquicentennial celebration. The 150th anniversary of the Ohio Statehouse is an opportunity for students K-12 to demonstrate their creativity by participating in the celebration. Students across Ohio have the opportunity to create a work of art based on the theme, “Picture Yourself at the People’s House.” Every work of art will be highlighted online at www.OhioStatehouse.org , and a rotating exhibit will feature a variety of submissions each month throughout the year-long celebration. Detailed information is available at www.OhioStatehouse.org . The Statehouse Museum Shop will unveil Ohio Statehouse Sesquicentennial merchandise to commemorate the year-long sesquicentennial celebration. Merchandise is also available at www.statehouseshop.com . January 29, 2011; 7 p.m. until 9 p.m.
Free, RSVP required by visiting www.ohiostatehouse.org ! Individuals of all ages are invited to attend the Grande Winter Ball hosted by Civil War re-enactors, 1st Ohio Light Artillery, Battery A. Come dance or watch. Learn how to reel or waltz. Dress in attire of the Civil War period or come as you are. This event highlights the time period in which the Statehouse was first constructed. The event is FREE; due to limited space an online registration is required at www.ohiostatehouse.org . The Ohio Statehouse will celebrate Black History Month throughout February with a special display, free historical performances each Tuesday at noon and special tours of the George Washington Williams Room. Visitors can also enjoy a special soul food menu at the Capitol Cafe each Wednesday in February. Visit the room which memorializes Ohio’s first African-American legislator. 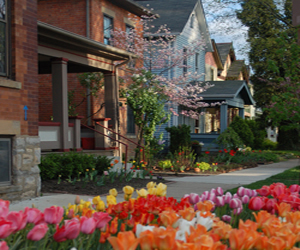 Explore Ohio’s connection with Abraham Lincoln with a visit from President Lincoln. Our nation’s 16th President will provide an hour-long presentation. The program will occur 150 years to the day from Lincoln’s historic speech to the 54th Ohio General Assembly on February 13, 1865. Free and open to the public, online RSVP required at www.ohiostatehouse.org . The 150th Anniversary of President-elect Abraham Lincoln’s inaugural trip from Springfield, Illinois to Washington D.C. provides an excellent opportunity for a conversation about the importance of the coming Civil War Sesquicentennial. The goal of the reenactment is to provide the public with insight into the issues that this nation faced just prior to the Civil War and illustrate how this story resonates today. This program is presented in partnership with the National Park Service. The event is FREE; due to limited seating an online registration is required at www.ohiostatehouse.org . Ceremony to take place at 2 p.m. The Ohio National Guard, in partnership with the Ohio Statehouse and Ohio Historical Society will celebrate the 150th anniversary of the first Ohio unit mustered into federal service for the American Civil War. The event is the statewide kickoff weekend for the Ohio Civil War 150 celebration. Visitors will have the opportunity see an 1861 encampment as well as a modern day encampment, meet “Abraham Lincoln,” see a variety of homeland defense vehicles and witness ceremonies honoring the history of America’s armed forces. This program is presented in partnership with the Ohio National Guard.